It’s the high note of your week! 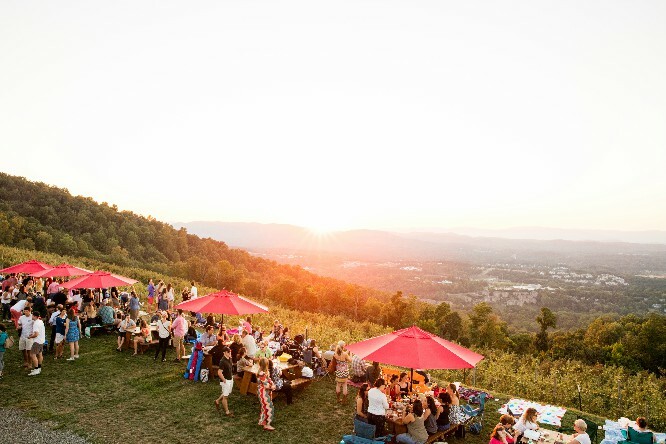 One of our favorite traditions on Carter Mountain is our Thursday Evening Sunset Series! Each Thursday from mid-May through the end of September, we stay open ’til 9pm. Join us for dinner, live music, hayrides, and the best view of a sunset anywhere! It’s free admission! Bring lawn chairs and blankets, or come early for a picnic table. Our Mountain Grill is open Thursday evenings with delicious dinner selections. Our menu varies from week to week and offers choices such as pulled pork BBQ, salads, wraps, fruit and cheese plates, hot dogs, fries, and of course our apple cider donuts and apple pie. Visit the Apple Barn for cider slushies, ice cream, and other snacks and treats. Outside alcohol is not permitted by ABC Law, but no worries, plenty of Prince Michel wine and Bold Rock hard cider available! Learn more about our signature events or check out other upcoming events. Hope to see you soon!